Challenge your limits with our 150 Km endurance ride designed across one of the most scenic and safe... roads around the city. Want to do a shorter ride? Complete the 75 Km ride across the most scenic and safe route across the ...city. Partner up with your family member / friend / colleague and participate in a one of a kind relay rid...e on the same route as above. 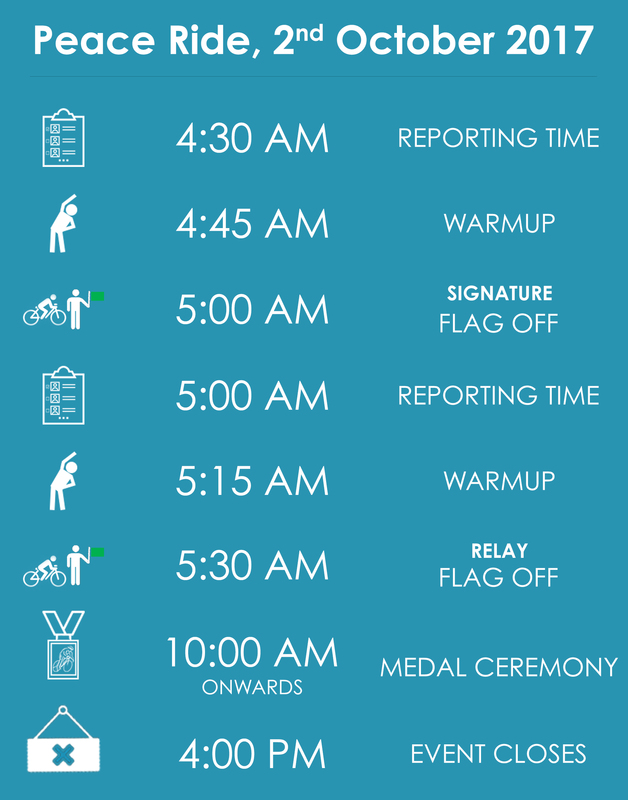 CYKUL invites you to be a part of India's oldest, best and longest reigning cycling event - The Peace Ride. CYKUL creates active communities by making cycling safe, fun and accessible to all. Join us for an experience of a lifetime on a route designed by experts. Both the routes are full supported by FRV - First Rider Vehicle, MRV - Middle Rider Vehicle & LRV - Last Rider Vehicle. We will also be providing breakfast/lunch from Zomato's top rated restaurants. Register now to avail special Freebies, Gift Vouchers & Discounts from our list of over 20 partners.